Double Single Including Full Biography,Interview with Tommy Vance 33 rpm + 2 Live Tracks. Live Tracks Recorded With The Rolling Stone Mobile. A1 Edited From The Forthcoming Album Borrowed Time. 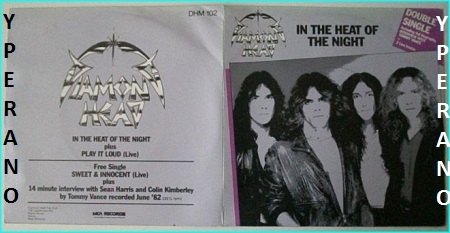 Heavy Storm CD Promo. Accept, Diamond Head, Gary Moore, Alice Cooper, Scorpions, Zed Yago, U.D.O., Alice Cooper, Gary Moore, Guess Who, Steve Morse. Check audio samples. SKU: YP-1819 Categories: All Genres, Epic Metal, NWOBHM, Search by Media Type, NWOBHM 7"